Properties FormDrops Weight69 (gms) Dimensions3 (cm) x 3 (cm) x 9 (cm) Indications of Dr. Reckeweg R33 Epilepsy and epileptoid attacks, twitching muscles. Mode of Action of Main Ingredients in Dr. Reckeweg R33 The ingredients form specific therapeutic antigens. Bufo: Specific remedy against epileptic fits and progressive weakness. 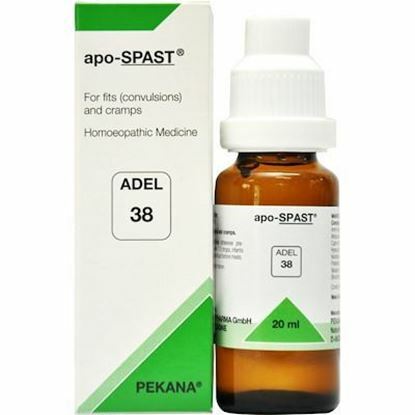 Cuprum: Against all kinds of cramps, in the thighs for instance, and especially epileptic cramps. Cerebral congestion Pulsatilla: Promotes vicarious effects in general, in the sense that diseases stifled in the past are rediscovered as an effect of vicariation. Silicea: After-effects of the suppression of perspiration from the feet.Acts on the constitution. Zincum: Various beneficial effects in case of convulsion, brings out stifled diseases of the skin. 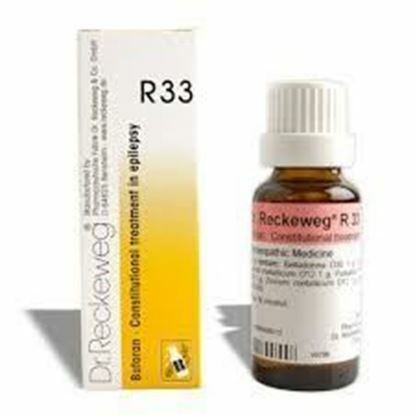 Dosage of Dr. Reckeweg R33 Generally 2-3 times daily 10-15 drops in some water by way of a prolonged cure. Prior to attacks or aHer an attack administer 20 drops every ½ hour for two hours. After treatment over a period to three months the dosage may be reduced to 10-15 drops once a day. Terms and Conditions We have assumed that you have consulted a physician before purchasing this medicine and are not self medicating. Properties FormDrops Weight60 (gms) Dimensions3 (cm) x 3 (cm) x 9 (cm) RECOMMENDED DOSAGE (Unless otherwise prescribed) Adults - 15-20 drops, 3 times a day in 1/4 Cup of water. Terms and Conditions We have assumed that you have consulted a physician before purchasing this medicine and are not self medicating.